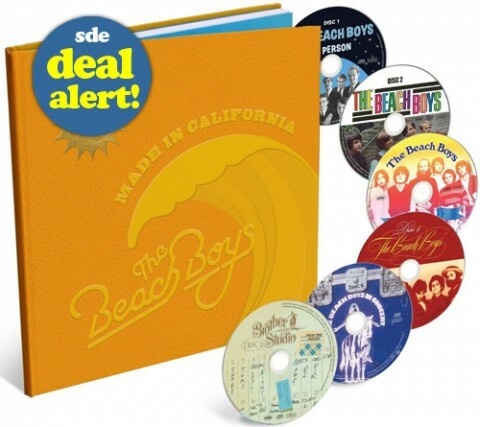 Fantastic deal now on Made in California, the six-disc 174-track Beach Boys anthology from last year. At the time of writing you can pick up this set at the lowest-ever price on Amazon UK of just £44. Absolutely amazing deal. Producer Paul O’Duffy reviewed this set for SDE back in December. The Pet Sounds box was listed for £12.99 again yesterday. Managed to snag a copy (seemingly on back-order) before Amazon’s stocks were exhausted. Not counting chickens until it’s dispatched. My replacement Disc 3 came within two days of contacting Universal, so get in touch with them if yours has the issues. This just shows how silly Amazon’s pricing structure is. You can buy the physical set plus mp3 download including the book for £44. To download the mp3 version on its own costs £49. No brainer really. Great price , thanks for the alert . Really enjoy the website , thanks . Thanks for the alert. Does anyone know if known issues with disc 3 of this set have been corrected or do they remain – hence the price cut? Matt, as far as I know it’s only the initial pressings that had the “two second” issue. You’ll probably not know until you play the disc. Still wondering about the Pet Sounds Sessions at £12.99 Steve H?!? Well, its due to arrive on Monday, and I’m listening to the Autorip right now. At 56.99 € incl. p+p (in Germany) it’s also reasonably priced on amazon.de. I just ordered it! Thanks for the ‘heads-up’. I’ve only got it for the rare tracks but it’s still worth it at that price. Just ordered from Amazon. Thanks for the heads up. Are the items listed on All Your Music brand new? I got the Ann Peebles ‘I Can’t Stand The Rain’ vinyl reissue from All Your Music for £12 incl delivery – brand new. as was the mono ‘Safe as Milk’ I got for a mate’s birthday. Quick shipping and cheap – job done. Damn you SDE, that money was going towards my kid’s kidney operation! Got a copy last month from All Your Music for £33. Hi Stan, what is all your music? Never heard of it. All Your Music is a leading seller on Amazon Market Place. Dispatched from the US. I use it regularly and never had a problem. The Beach Boys set was sealed and in pristine condition. Unlike Amazon, they don’t squash the spines of your deluxe digipacks into a package designed for a single jewel case. I managed to get hold of the Judas Priest Complete Albums collection from them last year for £29. Ok I had to pay £1.26 postage but still a good deal. I just had to snag this at this price. Thanks for the alert. And Pet Sounds Sessions has dropped to £12.99 !! Do you have a link for that Steve? Great deal. Came to just over £40 including postage Downunder. $75 Australian when best in Australia is $160. Thanks. Great, glad it was a useful!